Central bankers will meet this week, but only to sign off on the existing policy stance. Although it pains this fedwatcher to admit, the FOMC meeting is arguably the least important event of the week. It competes with a slew of critical data, including the employment report for October, to be released Friday. Plus, we should learn President Trump’s pick to lead the Fed when Yellen’s term expires next February. An FOMC meeting widely expected to yield no change in policy and likely little in the accompanying statement simply can’t compete with this week’s news flow. The Fed continues to follow its well-defined strategy of setting policy via balancing solid employment against weak inflation as the economy settles into full employment. 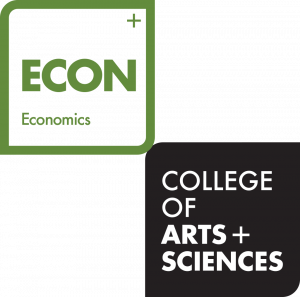 This strategy relies on a basic Phillips curve framework that anticipates intensifying inflationary pressures as the unemployment rate falls below its longer run rate. The Fed will see this as a tried and true strategy; they hesitate to abandon it on the basis of what they view as short-term inflation shortfalls. Following this strategy, I anticipate the Fed will continue to pursue the current projected path of policy as long as job growth remains strong enough to push unemployment lower. In other words, they are likely to continue to turn their attention away from the disappointment of low inflation in favor of the excitement of labor market gains. In practical terms, this means that emphasis on rate hikes will remain as long as the economy looks set to support job growth of more than 100k a month. 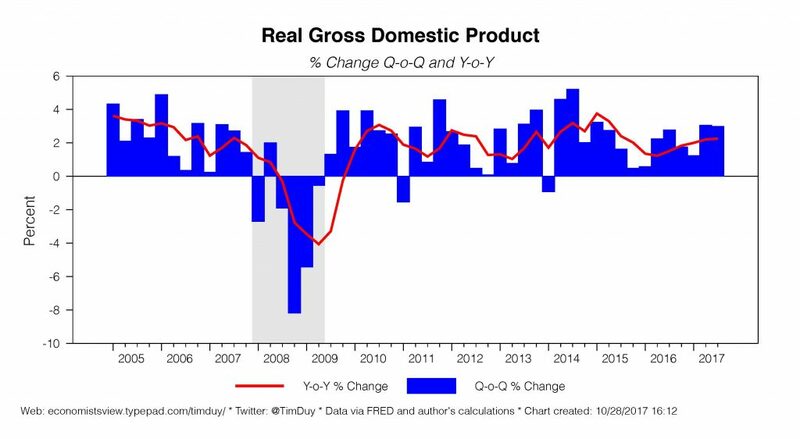 The third quarter GDP report will confirm their suspicions that this continues to be the case. GDP gained at a 3.0% rate in the second quarter after gaining at a 3.1% rate the previous quarter. This is the strongest back-to-back growth since 2014. Compared to a year ago, the growth was more subdued at a 2.3% gain, albeit still sustaining a trend of steady improvement. 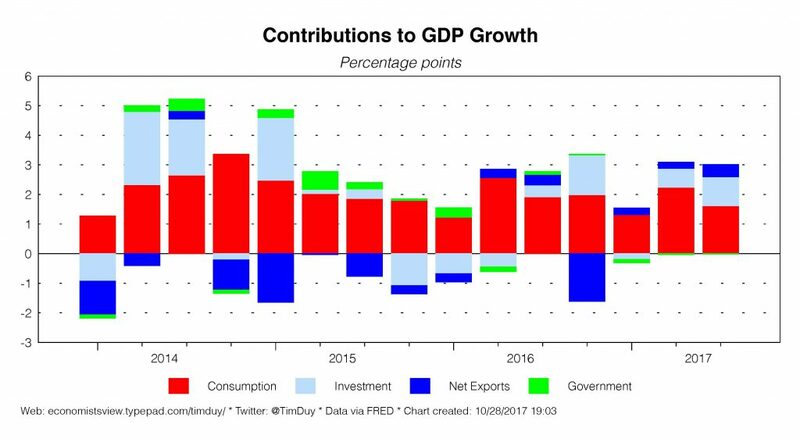 Digging into the numbers, the contributions from investment and net exports rose, while the gains attributable to consumption softened. 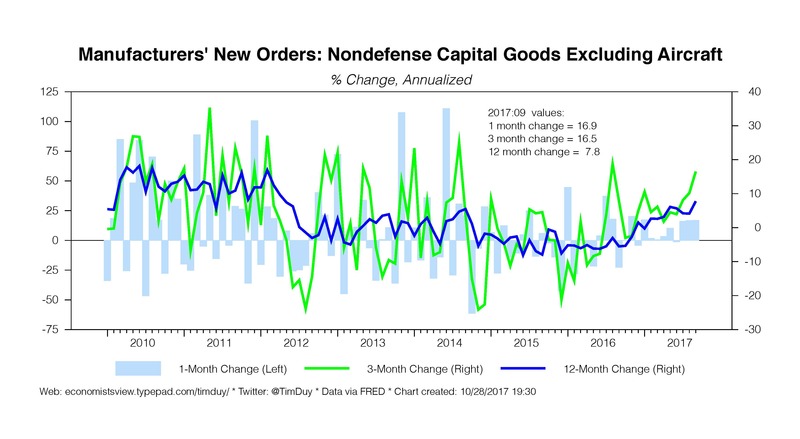 The Fed will be particularly happy with the investment gains (similarly, they will like the story told by the strong durable goods orders report last week). Investment was a significant factor in the slowdown of 2015 and 2016, and the Fed will be relieved that this wound is healing nicely. A look at averages over the last four quarters (noise in the quarterly numbers tends to hide underlying trends) reveals that while investment has begun to rebound from the 2015 decline, consumer spending has not. Nor I think should we expect a substantial acceleration in consumer spending at this point in the cycle. More likely is that while wage growth should rise further, the gains will compete with slower overall job growth to constrain spending growth. In other words, these numbers might be about what you might expect as the economy reaches full employment. The trend in net exports is only a small drag on GDP growth, but this is due to a particularly large negative hit in the third quarter of 2016. Net exports have made a positive contribution in five of the last six quarters. 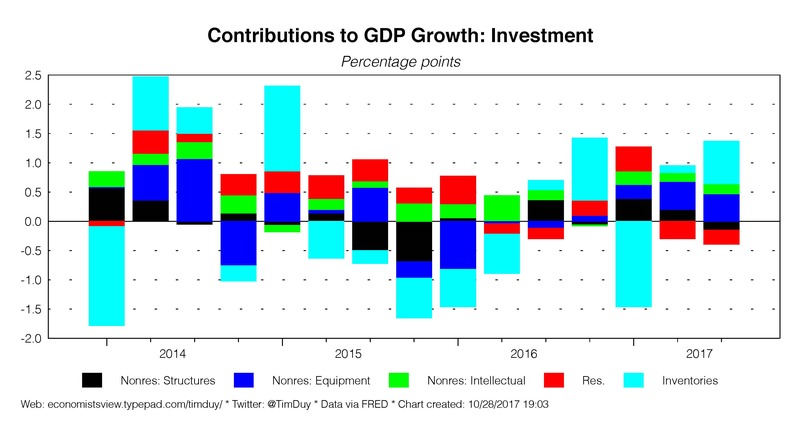 I would have expected a more negative contribution given the acceleration in investment activity, but apparently we need to see a more rapid growth in domestic activity such as from late-2014 to mid-2015 to drive a greater drag from the external sector. 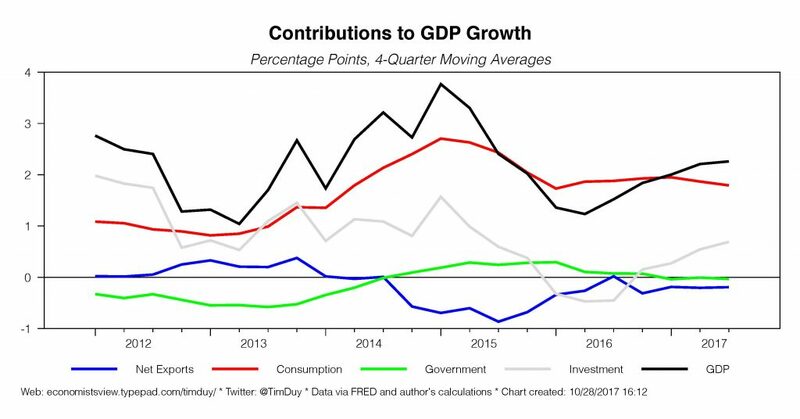 And then at least small contribution from government spending supported domestic growth; the government spending contribution has fallen to basically nothing (a small negative in recent quarters). Note the negative contributions from residential investment the last two quarters. With the multifamily sector likely over its peak for the current cycle, we need more single-family construction to support investment numbers in this sector. And although the trajectory for single-family is in the right direction, the pace of gains remains subdued. Overall these are numbers that will continue to add jobs at a pace sufficient to push down unemployment. Indeed, the pace of growth remains too rapid given current projections of productivity and labor force growth. Consequently, the Fed anticipates that growth needs to slow to maintain balance in the economy, and will be focused on tightening policy further to ensure that slower growth emerges. This is an environment that looks ripe for an acceleration in the pace of rate hikes should fiscal policymakers push through a substantial tax cut that stimulates domestic demand. As an aside, I can’t shake the feeling that the current pattern of growth remains very finely balanced, almost too balanced, as if it were ripe for a change. The selection of the next Fed chair devolved into a reality TV show. Even the losers are announced first; supposedly Gary Cohn is out of the running. So too are current chair Janet Yellen and former Federal Reserve Governor Kevin Warsh, at least according to the Washington Post. I never held out much hope for a Yellen reappointment on the basis of the politics, but still will be disappointed if she is not retained. That leaves current Federal Reserve Governor Jerome Powell and Standard economist John Taylor vying for the top spot. Trump reportedly leans toward Powell. This is the smart choice if Trump wants to keep the party going; Powell is likely to retain much of the current policy framework that has worked well. At best I would anticipate a only more slightly hawkish policy lean under Powell, and that would be fully data dependent. A choice of Taylor, however, would likely be more popular with Congressional Republicans. And Trump was reported to be impressed with Taylor. I don’t think we can rule out the possibility that this season has a surprise ending – a dual nomination of Powell for the chair and Taylor for the vice-chair. To be continued after this commercial break. On the data side of the story, the week begins with the personal income and outlays report and with it the inflation numbers. Expectations are for a meager 0.1% read on core-PCE inflation. 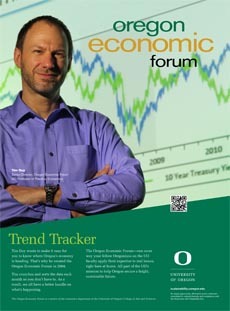 Tuesday brings us the employment cost index, the Case-Shiller home price index, and the beginning of the FOMC meeting. Wednesday brings the ADP job numbers, the ISM manufacturing index, construction spending numbers, and the conclusion of the FOMC meeting. Thursday is third quarter productivity numbers and jobless claims. And Friday are reports on employment, international trade, and the ISM service index. The consensus expects a rebound in nonfarm payroll growth to a whopping 323k after last month’s hurricane-induced negative print. Bottom Line: A nonstop week from beginning to end. Stage set for lots of excitement outside the FOMC meeting, none in the FOMC meeting. A December rate hike is virtually certain at this point.